In 1501, a 26-year-old Michelangelo inherited a block of marble that several other artists had worked without much success. A few years later, he completed his David. Originally intended for installation atop a building, the statue was soon judged too beautiful to put so far above admiring eyes. The marble block that Michelangelo worked came from the marble quarry of Carrara. Roughly 100 kilometers (60 miles) from Florence, the hotspot of Renaissance artistic achievement, Carrara lies along Italy’s northwestern shore. With the possible exception of marble from his own quarry in Pietrasanta, Michelangelo most favored Carrara marble. He was not alone in his admiration. Leonardo da Vinci invented a marble-cutting machine for the quarry, and Carrara marble is said to adorn the Pantheon and Trajan’s Column in Rome. 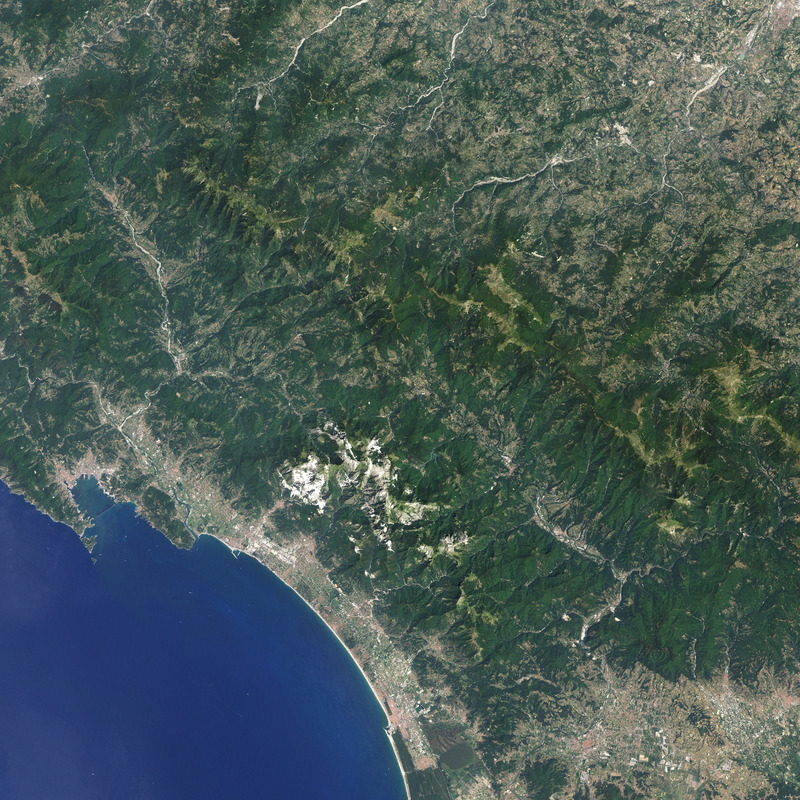 On August 1, 2001, NASA’s Landsat 7 Enhanced Thematic Mapper Plus sensor acquired this natural-color image of Carrara and the surrounding region. 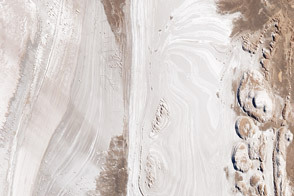 Straight lines and sharp angles distinguish urban areas from the wilder landscape of the mountains to the east, both sporting their share of marble. What might look like snow cover on the rugged mountains is actually bright white marble, contrasting with Tuscany’s lush green vegetation in this summertime shot. 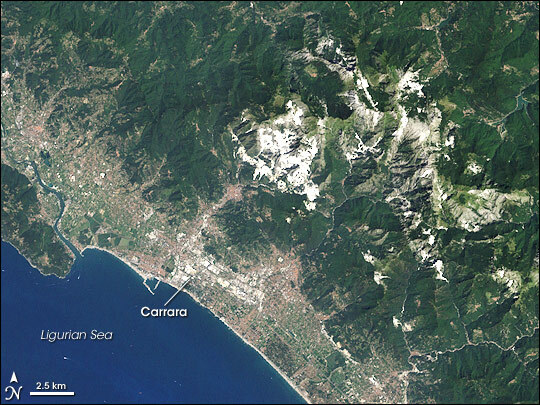 The Carrara quarries have been prized since the days of the Roman Empire, but the geologic processes that developed these rocks dwarf human timescales. 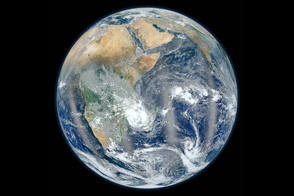 Marble’s origins actually lie in marine organisms that leave behind their calcite-rich shells when they die. As water bodies evaporate, these deposited remains form limestone. If the limestone gets buried under multi-ton layers of rock, the intense pressure and heat cause it to metamorphose into marble. Not all marbles turn out the same. Marble formed from the purest limestone is the white marble characteristic of Carrara. Impurities such as clay or iron oxide give other marbles darker colors. PBS: Going Places. Highlights of Tuscany. Accessed September 15, 2006. Wikipedia. Marble. Accessed September 15, 2006.